Let’s just cut to the chase and give Panera Bread the first ‘Be the Lime Award’ of 2018 with their New Years email. If your inbox is like mine, right now you are being flooded with ads for Paleo Diet, Weight Watchers, and Bowflex machines. Don’t get me wrong, those are just the big boys. I have plenty of little companies all trying to cash-in on the New Year’s resolutions in the form of health and wealth. Let’s face it, Panera COULD have run with their salad line up and been just like everyone else. But they didn’t. 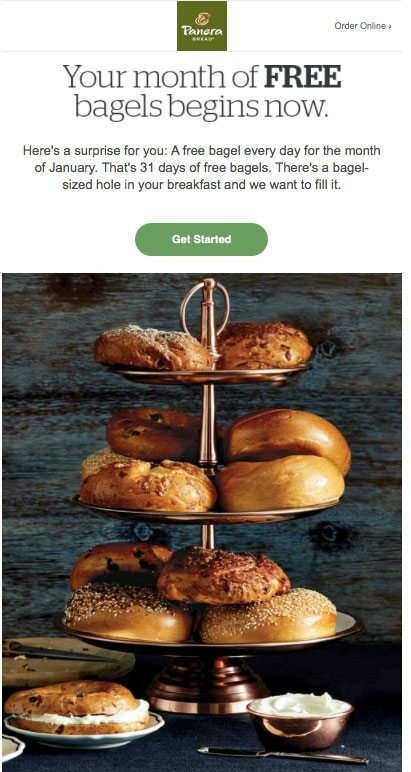 Nope…Panera just took an epic 180 and decided to give everyone free carb loading, I mean bagels, all month long. Not a lot else I can say other than WELL DONE PANERA BREAD, way to Be The Lime!